Apple's new entry-level iPad is just the tip of the educational iceberg. CHICAGO — Apple’s vision for the future of the classroom is clear: Students armed with iPads and quality apps, and instructors leveraging creative teaching methods. Laying the groundwork for a combination of interactive group projects, immersive audio and video experiences, and some gamification, Apple thinks students will find greater success in schools through the use technology. With yesterday’s big educational event behind us, we know a lot more about Apple’s vision for the classroom of the future. Previously, Apple promoted the base model iPad as a great tool for schools. However, the company never fully demonstrated how the tablet would work in classrooms. Cupertino’s 2012 education-focused event positioned the iPad and iBooks as a way for schools to replace paper textbooks with more engaging digital books. But a combination of the iPad’s price and a lack of control left many schools wary about adopting the technology. Six years later, Apple has gained some clarity. 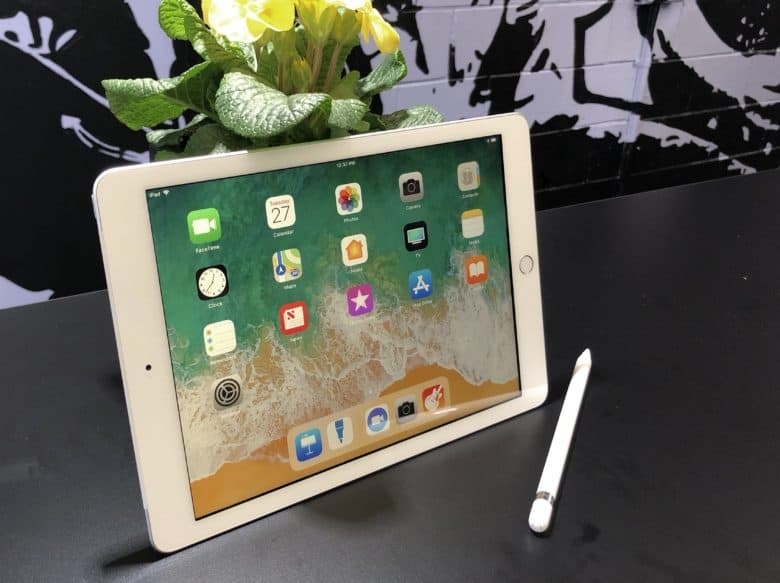 At the 2018 event, Apple did more than simply introduce an updated, less-expensive iPad that supports Apple Pencil (and Logitech Crayon). Cupertino also gave schools some new software for the classroom. Smart Annotations allow teachers to add notes that follow changes in iWork applications. After the keynote finished at Lane Tech College Prep High School here, handlers sent attendees into classrooms. There, we got a glimpse of what a class powered by the iPad and Apple apps might look like. Apple did not allow photos or video in these rooms. Our classroom looked like a typical science classroom. It had stool-height lab tables, surrounded by various science-y models and a 60-inch television (with Apple TV) in the front. And, of course, iPads on all the desks. That ideal iPad-to-student ratio led us to work in pairs, which helps people interact and learn socially. Our first lesson? Math class, out of Apple’s new “Everyone Can Create” curriculum, which involved exploring the Fibonacci sequence. The instructor walked us through identifying the spiral sequence (1, 1, 2, 3, 5, 8 …) in nature. We also created a poem that followed that syllabic pattern. Using Apple’s Clips app, we crafted a short video introducing the poem. We combined images from nature that include the Fibonacci pattern, the text of the poem and music for a backing track. For actual students, this interactive learning would mean auditory and visual mnemonics to help them remember and identify the Fibonacci sequence. 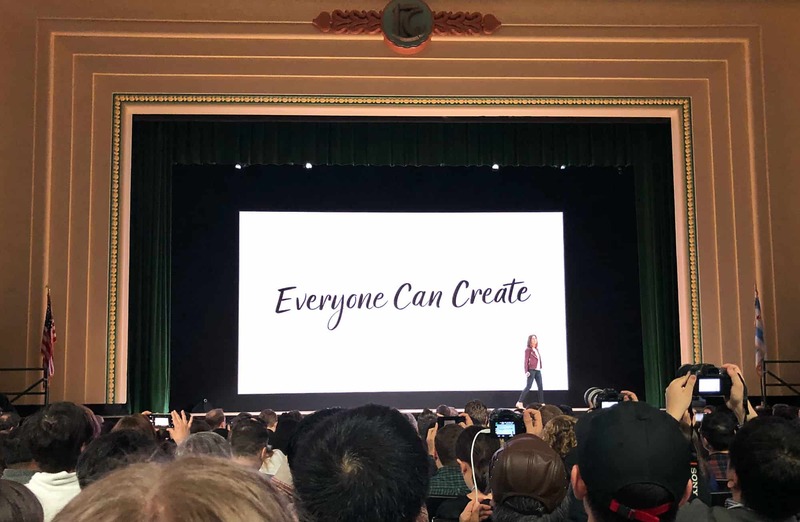 Apple rolls out its Everyone Can Create curriculum at its iPad event on March 27, 2018. Our second lesson: another “Everyone Can Create” lesson in history class, with a little help from GarageBand. Using the newly added “Planetary” live loops pack in Apple’s music-making software, we created an atmospheric audio bed, complete with recordings from an Apollo shuttle launch. This formed the foundation for reciting a portion of President John F. Kennedy’s infamous “We choose to go to the moon” speech. Using GarageBand transformed a short, 25-word quote into something we could remember and visualize thanks to the far more immersive experience. The third and final lesson came out of Apple’s “Everyone Can Code” series, and involved an introduction to Swift Playgrounds. After a short intro on how Apple’s educational coding application teaches Swift using auto-complete and code suggestions, we moved on to creating a dancing robot. Using Swift Playgrounds, we set background music to a virtual “Meebot,” then programmed various dancing actions. Once we completed our programming, we paired an actual Meebot robot to our iPad. Then we watched our robot dance to our commands in real time, right on the lab table. Indirectly on display during our “class” was Apple’s Classroom app for teachers. With just a few short taps on the iPad screen, our instructor launched the various apps we used for the lessons. The teacher simply chose Clips, GarageBand or Swift Playgrounds, then toggled the “lock application” switch. Then the student iPads launched the desired application — and we were unable to navigate away. This enabled the instructor to proceed with class, knowing we were all actively participating instead of surfing the web or messing around with other apps. Apple’s Classroom app gives teachers control. 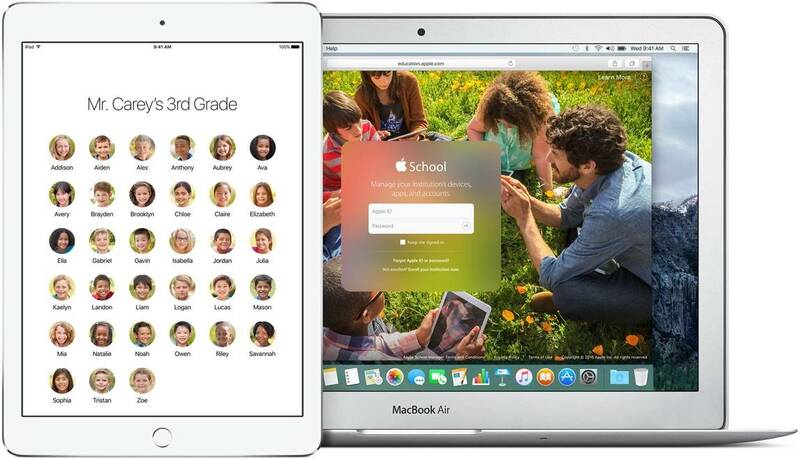 During Tuesday’s keynote, Apple also highlighted the upcoming Schoolwork application. Using it, an instructor can assign homework, provide updates to students, or even link specific sections of ClassKit applications for student use. These applications can all be installed remotely, so students have no excuse to not have the desired app. Apple’s Schoolwork app also gives instructors the ability to see student progress on app-based homework. It displays values for time spent in the application and for the percentage of assignments completed. With this, a teacher can know who completed their homework before class even starts. The final piece of Apple’s education puzzle revolves around its iWork suite. 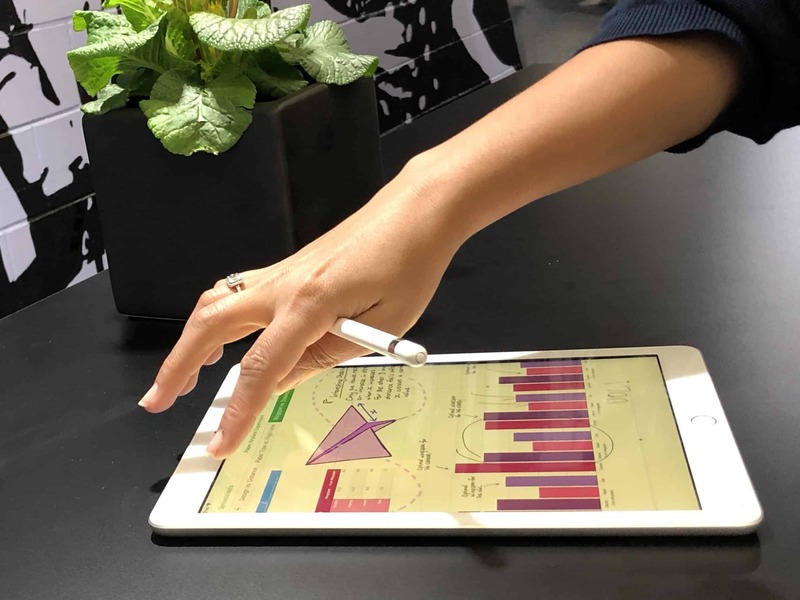 Within Pages, Keynote and Numbers, a teacher will be able to use Smart Annotations to provide feedback quickly to students using an Apple Pencil. Unlike traditional markup, Smart Annotations can be linked directly to words, images or any other content in the iWork applications. That allows comments to flow conveniently with text. 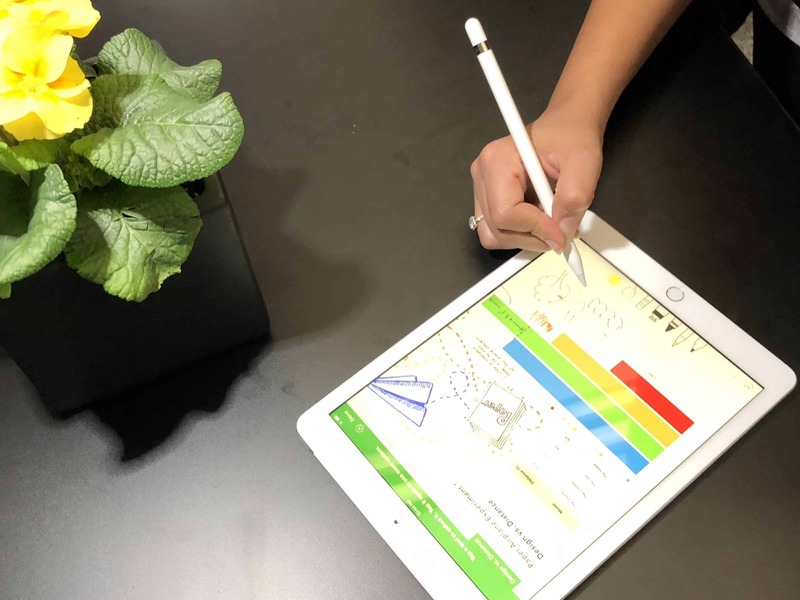 Numbers on iPad gained full Apple Pencil support at Apple’s education event. This means that as a student makes additions, changes or corrections, the teacher’s marks will stay connected to the right items. Additionally, iWorks’ collaboration features allow students to use those same Smart Annotations to work together on presentations or documents and provide precise commentary on their coursework. Using the iPad and Apple’s apps, students in Apple’s ideal classroom can see first-hand how technology can elevate the learning experience. Instead of textbooks or lectures, during Tuesday’s Apple demo we experienced more personal, memorable and tangible educational tools. With the added ClassKit API, developers of educational apps will now be able to integrate directly with Apple’s Classroom app. This should allow devs to build immersive augmented reality experiences or creative interactive applications. 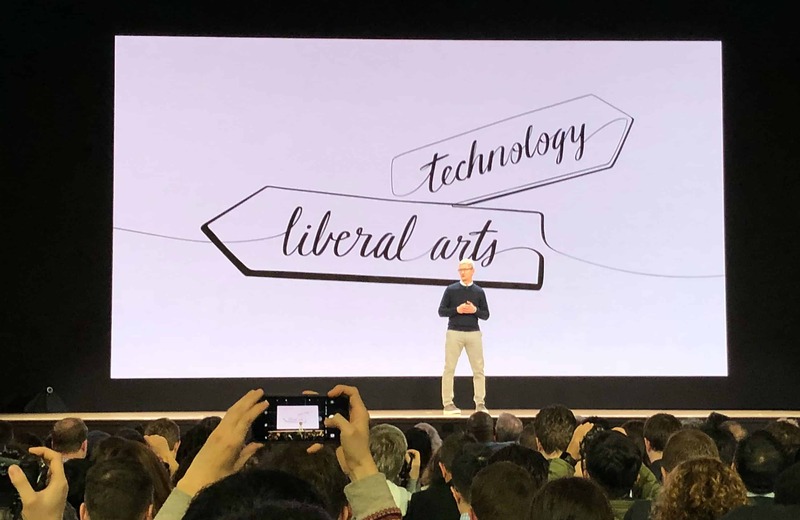 At Apple’s education-oriented iPad event, Tim Cook positions the company squarely at the intersection of technology and the liberal arts. Apple has been involved in education for 40 years. The company places itself squarely at the intersection of liberal arts and technology. Tuesday’s event in Chicago served as a showcase for the company’s continued dedication to education. It also provided a crystal-clear picture of how Apple sees the future of the classroom. Now it’s up to schools to make it happen for their students.